People who have taken a DNA test from 23andMe know that the information their saliva sample yields is important. Your DNA results can point you towards people you might be related to, and can also provide some information about your health. 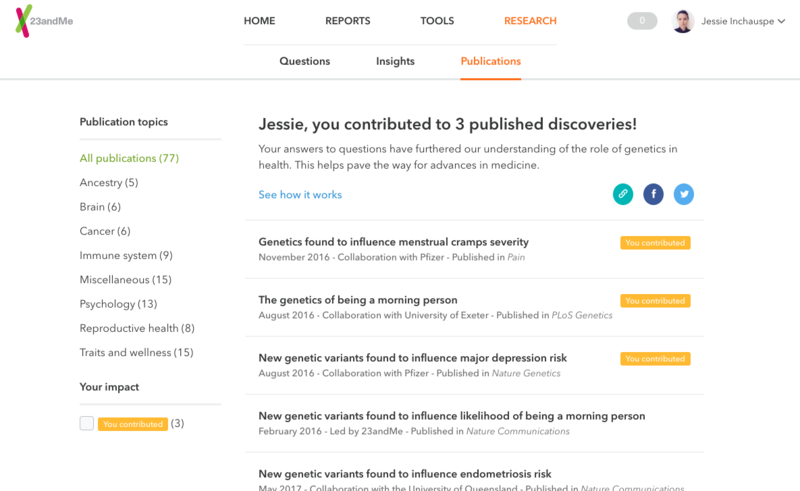 Now, 23andMe customers can see their contributions to research. 23andMe gives customers choices that allow them to control how their genetic information is used, and with whom it is shared. You can choose whether or not to store your DNA sample. You can also choose to opt-in to having your DNA used by researchers. Those who opt-in will have their genetic information stripped of personally identifying information and transferred into 23andMe’s research environment. It is stored with your survey response data and assigned a randomized research identification number. If you have opted in to allowing your data to be used by researchers, you might be wondering what it was used for. Who did it help? What was learned? Now, 23andMe has made it possible for customers to see their contributions to research. 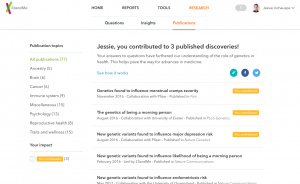 They have added a feature to their logged-in site that lets 23andMe research participants see how their research responses and DNA were used and which published scientific discoveries they have personally helped fuel. Participants will see a list of Publication Topics. Individual studies will show a “You Contributed” tag if your data was used in the analysis performed by 23andMe researchers to lead to a new breakthrough. On average, it takes about two years from the moment a customer answers a question to the publication of a new discovery that leverages their data. Every 23andMe customer who would like to participate can choose to allow their data to be used in research. The option is not limited to people who have health or medical conditions. It is important that the data from healthy people be used in research too. This group provides a control group to compare against the DNA of people with a condition (cases).